If we have learned one thing from science fiction movies and novels that deal with time travel then it’s the fact that it’s usually not a good idea to mess with time itself because you can never know what grave consequences only minor changes to the timeline can have. 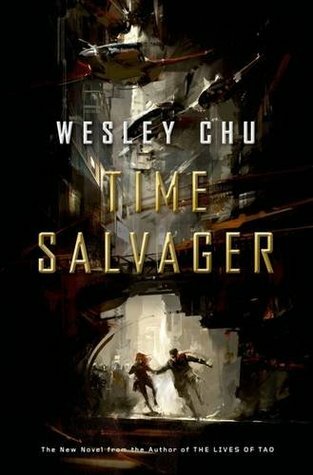 And even in Wesley Chu’s „Time Salvager“ which is set in the 26th century where time travel is nothing special anymore and in fact a basic requirement to keep mankind alive there are very strict rules concerning how to properly use time travel without setting hell loose by messing up what the author calls the „chronostream“. However 500 years into the future it’s impossible not to rely on time travel because the outbreak of a toxic bacterium has turned Earth into an ugly wasteland where the once blue oceans have long ago became a brown wastewater and cities are nothing more than futuristic slums that house only those poor souls that can’t afford to flee into the outer system and seek a more livable environment. Due to the collapse of the eco system the planet is no longer able to provide the resources that mankind needs so that huge corporations send people into the past to salvage old resources or artifacts that ensure life in the 26th century – paying attention to only harvesting from places in time that are close to being destroyed anyway by any kind of disaster so that the chronostream won’t be altered too much and gets the chance to quickly heal itself after a salvage. One of these so-called „chronmen“ is James Griffin-Mars, a convicted criminal and definitely not the most cheerful person in the galaxy and when I met this character I was afraid that he would be giving me quite a hard time throughout the story because his life seemed to consist of only two things: time salvages and heavy drinking and while I was definitely interested in the first aspect the second one is an absolute no-go for me. Thankfully James soon found something „better“ to do by breaking the first and most important time law (to never bring anyone back from the past) and since he’s the first chronman to ever commit such a capital crime his life immediate turns into an even uglier mess than before – and all this for a woman. Is this love worth messing with time? You could almost say that deep inside „Time Salvager“ is a love story because all the upcoming events are caused by James falling for Elise Kim, a scientist he meets during a salvage in the 22th century and saves from finding her death in an explosion that is supposed to follow James’ raid. Now a drunken protagonist and a love story certainly didn’t seem like the perfect preconditions to make me enjoy this book but surprisingly James Griffin-Mars grew on me quite quickly and while the romance kind of triggers the plot and keeps giving the chronman a motivation for his actions it never becomes a dominant part of the story and is sometimes actually even quite cute. What I really liked about „Time Salvager“ was the setting. Well, definitely not because Earth in the 26th century has become such a lovely place but because I found the future history of the planet quite fascinating and it was interesting to see how on the one hand time travel has become a basic requirement to keep the planet alive but on the other hand the corporations were still trying to regulate it to not mess up with the chronostream and I found the whole system about the chronmen, their handlers who help them execute their time travel missions and the auditors who are supposed to supervise the chronmen and keep them from violating any time laws, quite intriguing. Wesley Chu also did a good job on showing the impact this world and his profession had on the main character because going back into time and seeing people cluelessly facing their near deaths over and over again didn’t leave James cold and caused some PTSD-like depression that made it hard for him to keep a clear mind. Can I have a bit more science, please? 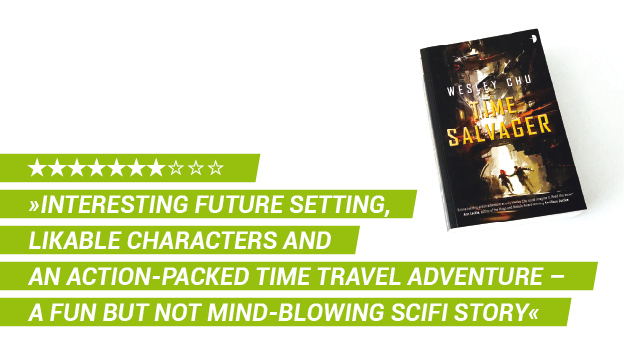 I was a bit disappointed though about the actual time traveling because the author kept the science behind it quite simple and I often had the feeling that time travel was rather used as a means of transport than a plot device. I’m far away from being an advanced physicist and sophisticated time travel stories often tend to give me a headache with all their time loops and paradoxes but to be honest I love those stories most that really mess with my brain and in this regard „Time Salvager“ was just not very challenging. Don’t get me wrong, I really enjoyed visiting different eras of planet Earth and getting a few glimpses at our potentially dark future(s) but sometimes I had wished the plot would’ve spent more time in these particular eras and caused more havoc and not just mostly take place in the main future setting. Another thing that bothered me a little bit was the ending which felt a bit anticlimactic and not completely satisfying because it relies too much on the sequel and leaves it to the second book to answer some of the important questions. Also the middle part of the story was a bit dragging and after the exciting first third of the book it took the plot a while until it picked up pace again for the ending. However I really enjoyed the great character dynamics between James, Elise and especially the 93-year-old Grace, Earth’s genius pioneer of time theory, I liked the humor, the different futuristic gadgets and even the slow romance and I definitely want to read more about this world – hopefully just with a little bit more time travel mindfucking in the next book „Time Siege“. Wesley Chu's "Time Salvager" is an enjoyable science fiction adventure that comes with an interesting future setting, likable characters and an entertaining and action-packed story but turns out to be a bit underwhelming when it comes to the time travel aspect which is kept rather simple and won't challenge you with in-depth science or mind-blowing time paradoxes.